There are only 127 days left until our trip to Walt Disney World. That means only 127 days until my husband and I step on board an airplane with four special needs kiddos who have never flown before. To say I'm nervous is a bit of an understatement. It's not just the plane ride that causes anxiety. The first day of our vacation in general is going to be absolutely crazy! Yes, we will end up in Walt Disney World in the evening. But, it's a very long day of travel. Especially for those who have never done it before, or those who don't enjoy it (my husband). I'm praying fervently that the day goes well. In total we will spend 12 hours traveling and waiting to arrive at Walt Disney World. Now, I know many other families have traveled before us. 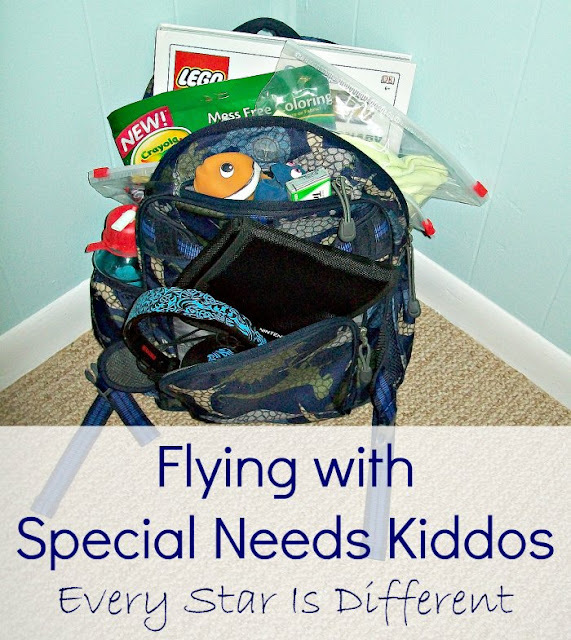 I know many other families with special needs kiddos have flown before us. But, I can't just brush off comments from others, especially from those who know my children well. "What if you get kicked off the flight because of one of the kiddos?" "How in the world are you going to do this?" Trust me, Jason and I have thought about all of these things and spoken with the airline SEVERAL times. 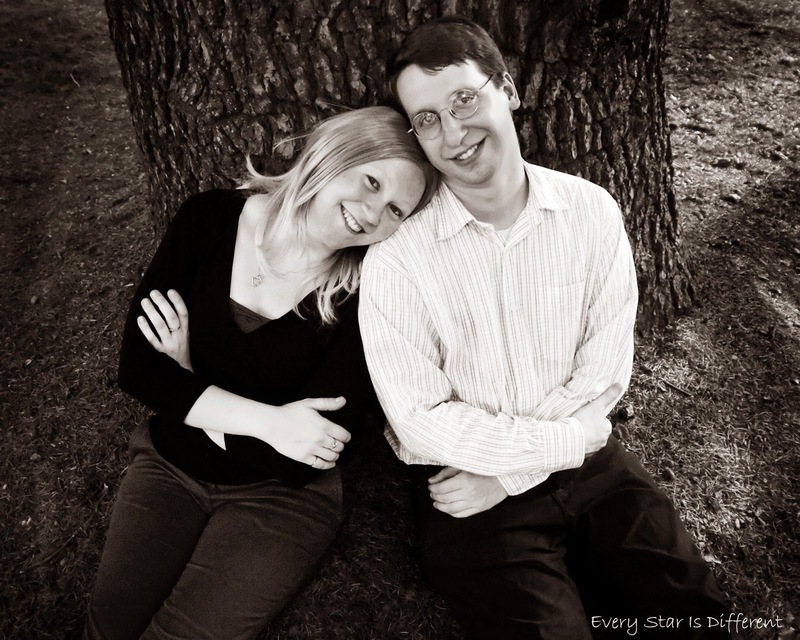 We can't predict how many kiddos will struggle or how much. We're preparing for the worst case scenario and prepping the kiddos like crazy for this trip! My biggest fear is not one of the kiddos screaming during a flight. I can handle that. But if one or more of the kiddos dislike flying after their first flight... I can picture myself having to physically carry them on to our second flight kicking and screaming. All of this, just to get to our vacation destination. Sigh. Needless to say I have read every air travel post ever written, trying to prepare myself for this experience. There are some great posts out there. 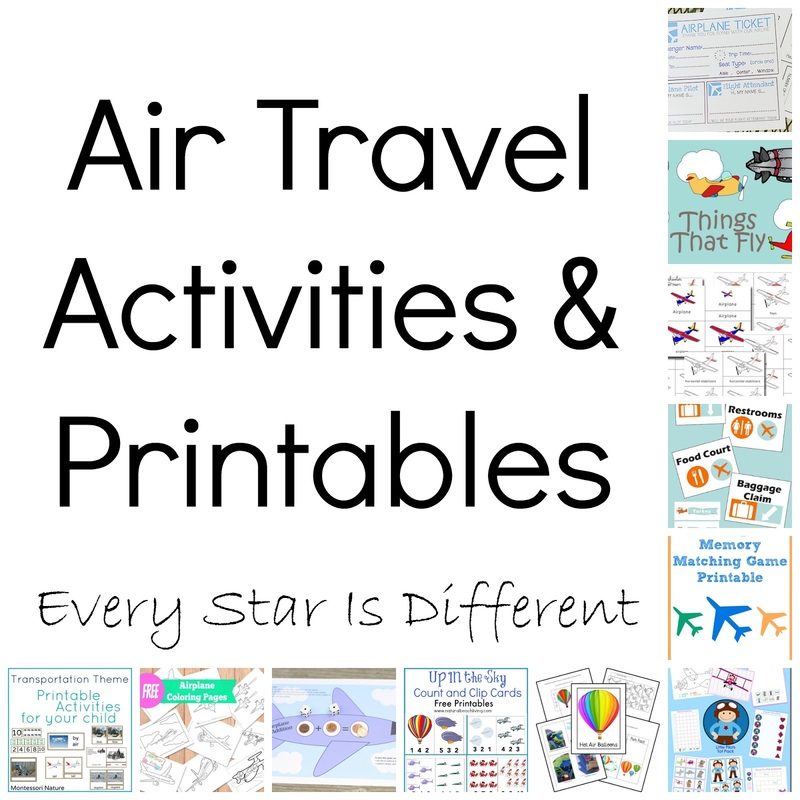 If you'd like to read my favorites, be sure to check out my Air Travel with Kids Pinterest Board. Sadly, I didn't come across any from parents of special needs kiddos. I couldn't resist sharing everything I've learned so far. 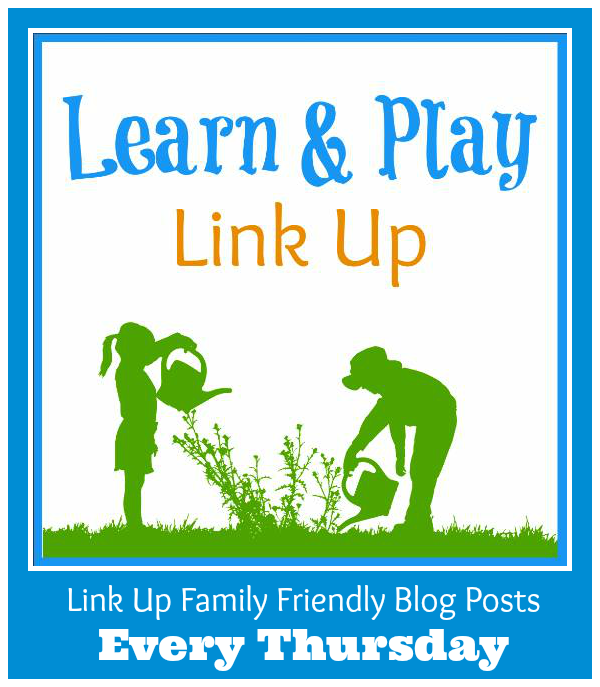 The tips I'm sharing below, are those a parent of special needs kiddos should consider, in addition to tips already mentioned in every other post I've read. 1) Book your flight reservations over the phone with the airline. It's important that you speak directly with the airline to make sure all needs can be accommodated. For us this meant accommodating seating arrangements, food allergies, and more. I was guaranteed seats together, even if flights change. I was able to learn the brand and name of every snack and drink offered on the flight. It was noted that we would be flying with four special needs children, and therefore may need extra help. Bulldozer and Sunshine will be using adult strollers as handicapped accommodations, due to their autism related tendencies. The airline was amazing with us and answered so many questions. 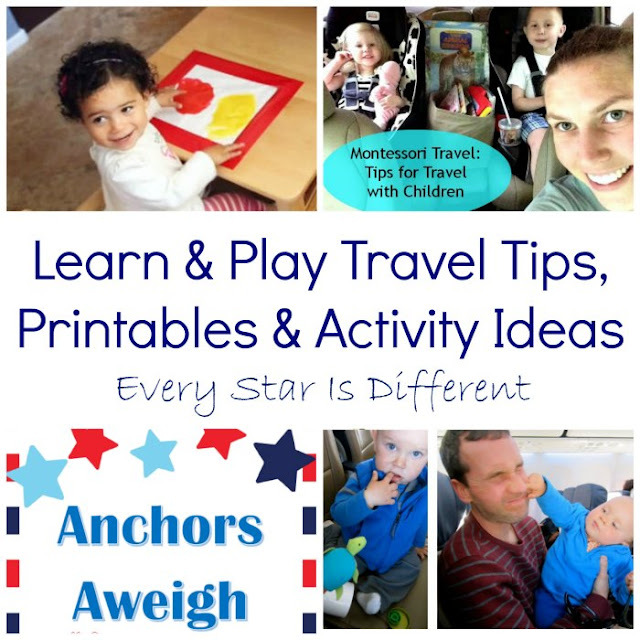 2) Prepare your kiddos for the airport and airplane experiences in as many ways as possible. Remember to prepare them not only for the order of events, but also for the sensory experiences along the way. There are A LOT! 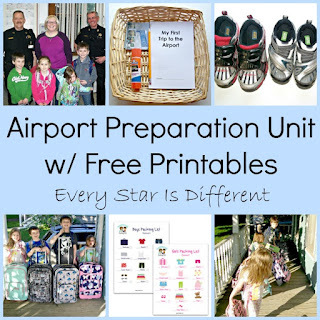 If you're looking for resources, be sure to check out my Airport Preparation & Airplane Units. 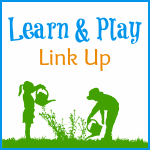 Both include very detailed social stories for kiddos, along with many other activities and preparatory experiences. 3) Request "Silent Boarding" once at your gate waiting to board every flight. I'm not sure if the wording is specific to JetBlue Airlines, or if it's a known phrase with all airlines. No matter what it's called, it can make all the difference in your day. What does "Silent Boarding" mean? You are escorted by a crew member to board the plane before anyone else, including families with young children. This way your special needs children don't have to wait in any lines. They don't have to be overwhelmed by others trying to board at the same time. There's no crowding. Finally, they can slowly adapt to the plane without rushing. You will have a longer wait on the plane, once you're seated, but slow transitions tend to be best for my kiddos. As long as they don't have to be buckled in for that wait time, we'll be okay. 4) Prepare for anxieties! My husband and I have been working diligently to come up with plans for entertainment during our travel day. 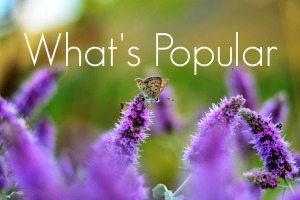 There are countless posts about busy bags on the web. If busy bags work for your kiddos, be sure to pack several. 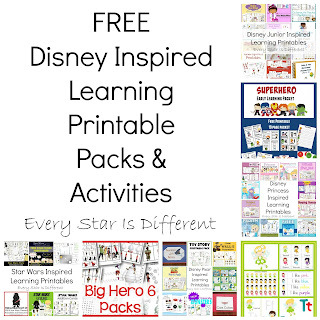 For ideas, be sure to check out my Busy Bag Pinterest Board. 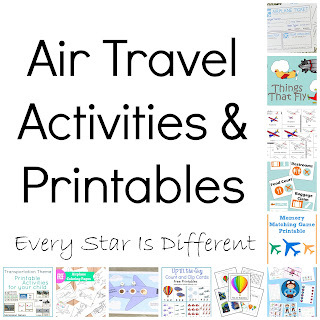 If you're looking for airplane themed free printables that can be used for busy bags, be sure to check out my Air Travel Activities & Printables post. 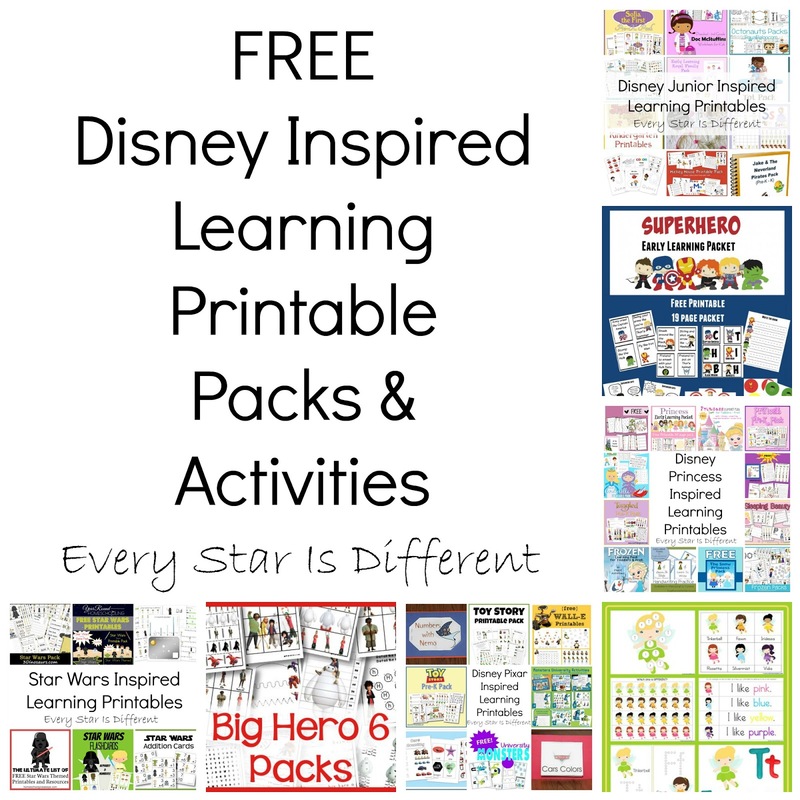 If you're flying to Disney destination, you don't want to miss my FREE Disney Inspired Learnig Printable Packs & Activities. In our case, busy bags would cause more anxiety to an already extremely anxious situation for our boys. We're working to put together entertainment that will soothe and comfort, or at least, distract them. So far, this includes a brand new hardbound encyclopedia of their favorite show or LEGO theme. These books are their VERY favorites. They can look at them for hours. Princess and Sunshine are receiving a new hardbound collection of their favorite Disney stories. I'm hoping the books will work perfectly while we're waiting for take off, even if there's a delay while on the runway. The kiddos each have new Color Wonder packets. 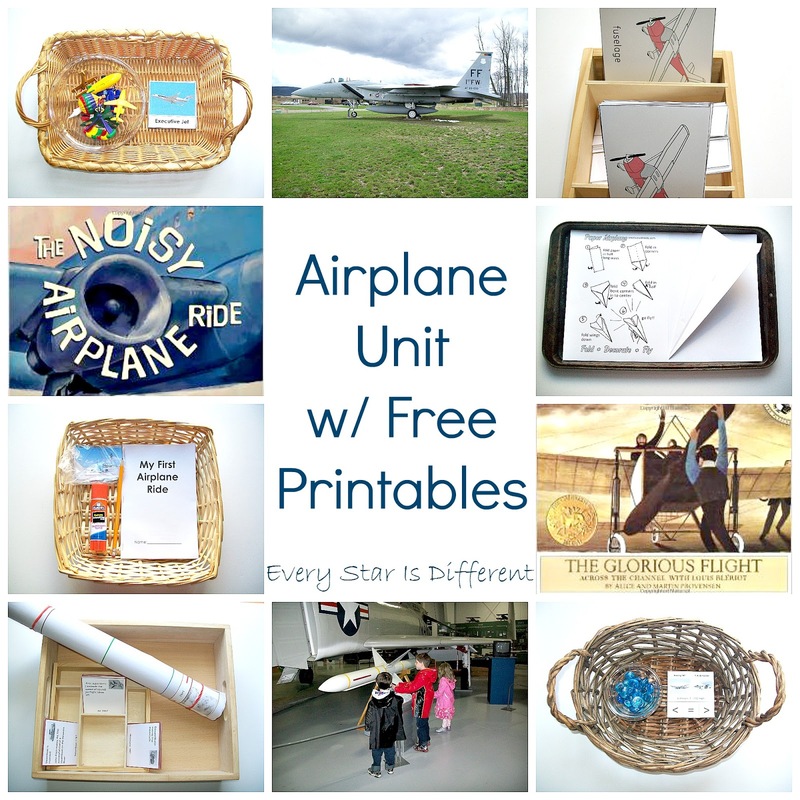 These are a very rare treat for my kiddos and provide them with a task that helps them relax. Color Wonder packets will be saved for our second flight (3 hours long), when the kiddos are bored with their books, media, etc. I found adorable Disney character stress balls for the kiddos to use during take off and landing, or any other time they may be in distress while flying. I'm hoping between the stress balls and comfort foods, the kiddos will relax. Finally, the boys will have their own handheld Nintendo game systems with them. Princess will bring her Leap Pad. Sunshine will have access to the iPad, supervised by an adult. All have headphones. They'll each receive a brand new game to play for our big travel day. There is nothing that calms Bulldozer more than his video games. Since we'll be traveling all day, we've been very specific with the kiddos about when they can use their media devices. (I don't want batteries to run out.) Kiddos can use them while in the air, when electronic devices are permitted, and on the shuttle bus to our Walt Disney World Resort. While at airports, we'll be on the move. Sunshine freaks out when she feels restrained of confined in any way. (Hence why we're not attempting a 3-day car trip.) I'm hoping if she gets to move around while on land, she won't be as bad in the air. We expect that Sunshine will struggle during the flight no matter what, so I'm putting together busy bags to distract her. She LOVES doing learning time activities more than anything else during the day at home. Hopefully it will provide her comfort while in the air. I'm sure Princess will use busy bags as well. She responds much better to anxious situations when she has something to keep her hands (and mind) busy. Remember that each kiddo is different. What works for some kiddos may not work for others. Take time to really think about what calms your special needs child in the most anxious situations. Those should be your go to items for flights. 5) Bring LOTS of food! The thought of bringing enough food for an entire day is still a little bit daunting to me. I have no clue if there will be any delays in our plans. I can't guarantee we'll have time to purchase food during our layover. Hunger and special needs kiddos don't get along. Be sure to plan accordingly and keep in mind how comforting specific foods may be for your child. They will eat more than usual while traveling. Then prepare for specific situations during the day where food will be helpful. My main focus, besides meals, is food for take off and landings on both of our flights. I'm prepared with gum, but two of my special needs kiddos can not or will not chew it for long. So, I'm bringing lollipops, fruit snacks, gummy bears, starbursts, skittles, and as many other super chewy and/or crunchy foods as possible. Once past security in the airport before our flight, I'm planning to fill up water bottles, so the kiddos will have a drink if they need it. I am so excited for our vacation. Quite honestly, I think I'm more excited than anyone else in the house. If we can successfully make it through everyday of our vacation, that means my kiddos will have grown so much! My only hope is that as we prepare for each day of the trip, I can give them the support that they need to not only get through each new experience but overcome their challenges triumphantly! 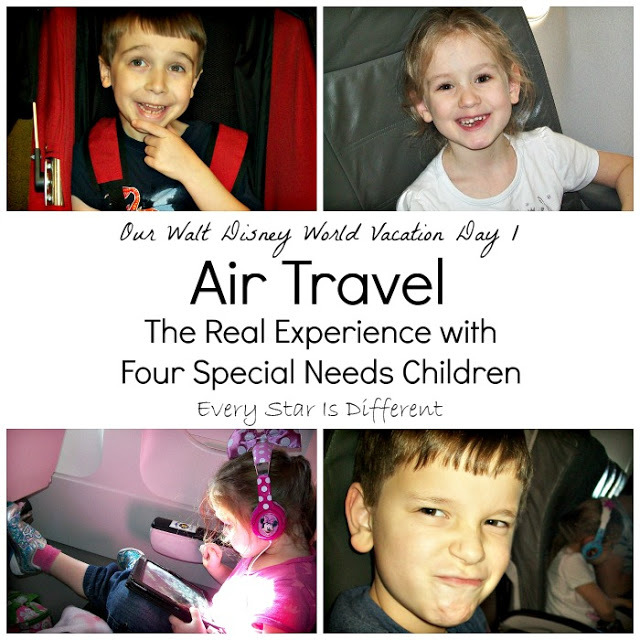 For those who are wondering how our first flights with four special needs kiddos went, you can read all about it here! Note: There's one extra tip that you don't want to miss in the post below. I promise it's well worth your time to learn about. Your stress and frustration at the airport will be cut in half! I'm super excited to feature some great posts that include travel tips, travel printables, and busy bag ideas. Whether it be by plane, car, boat, etc. There's something for everyone!